"Costa Rica?" We had to check a map to find Costa. Four of us were planning a surf trip together. We were trying to pick a location for a one week surfing safari. We didn't know anyone that had surfed there, but heard Costa had surf ... somewhere. There were no surf-travel agencies offering packages, tips and maps. And, of course, no Internet existed at that time. But I knew pro surfer Todd Holland's mom was a travel agent working out of a small agency on A1A in Cocoa Beach and that she knew something about the place. So we went to Carol, booked a date, purchased airline tickets to San Jose and arranged for a Land Rover rental vehicle. Our adventurous band included George Rose, Martin Koivu, Greg Wooten and myself. We didn't have surfboard travel bags in those days, so Martin had some fabricated at his work where they manufactured containment booms and barriers. We didn't have any maps and we didn't know of any surf breaks, beaches or hotels to search for. We did know that Nicaragua to the north was in the midst of a violent civil war and there was much violence to the south in Panama. We were excited but apprehensive as we knew that we would soon embark on a bonafide surfing adventure. We had an 8am Lacsa flight out of Miami, so we drove all night to arrive there by 5:30am and off-loaded our bulky, bright yellow surfboard travel bags. Standing in line to check in we began to feel the flavor of our trip as we were surrounded by mostly Costa Ricans returning home after a weekend of shopping in Miami. They had new TVs, stereos and large boxes packed with store bought clothes... and crates of live chickens. After a brief flight, we were approaching San Jose thru the beautiful mountains and low hanging clouds we were seeing for the first time. The airport was much smaller then. We landed, processed easily thru immigration, claimed our luggage and boards, then walked out the front door and across a small parking area to pick up the Land Rover. We loaded up, checked water, tires and battery then headed West to the coast. ~ ~ ~ Destination unknown. We survived that first drive thru the mountains and found ourselves in the seaport city of Punteranous just as the sun was setting. It had taken us about 6 hours to find our way from the airport to the coast. The roads were horrible with no signage. Seeing Punteranous Bay (near the ferry) was very discouraging as it was flat as a lake. We found a little hotel, checked in and visited a small family restaurant next door for dinner. I saw Roballo on the menu, asked what it was, and was told ..."is a fishes". "Good grief!" I had visions of boiled whole fish with eyes popping out so I opted for chicken instead. I later learned that Roballo was snook and was usually served broiled. After a good night's sleep we checked-out and asked the manager which way to travel to find surf. 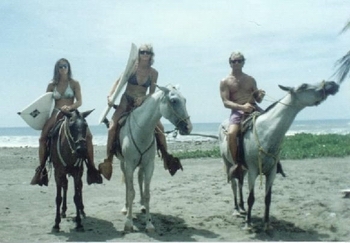 He pointed south and mentioned a nearby bridge at Boca Barranca where he had seen surfers once before. Soon we were crossing the bridge and slowed to observe what looked like one foot perfect lefts peeling slowly across the bay. "Flat!" was the consensous, so we continued south. We later learned that those waves were breaking further out than we thought and that the size was probably three to five feet. We passed the Caldera area and struggled to find a decent road to continue south. Those nice paved roads we now enjoy were non-existant at that time. By mid-morning, we saw a little sign reading Jaco Beach and turned right to see if we could find some surf. We followed a dirt road to the beach and were stoked to see righteous head-high surf. We looked south down the beach and saw two surfers paddling out. "Let's find out where those guys parked!" We followed the road to a hotel were we thought they may have been. We parked in the hotel's parking lot and walked through its beautiful open air lobby, past a pool to the beach and found them surfing out back. "Wow!" We saw black sand beach with glassy A-frames breaking both ways. 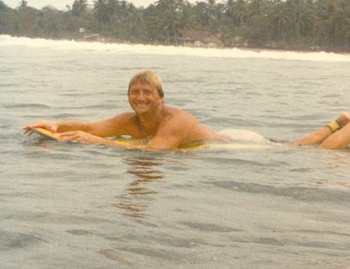 We decided to surf it, ran back to our vehicle, changed in the parkling lot, grabbed boards and wax and paddled out in front of the Jaco Beach hotel, now the Best Western. Wading out through the surf, we could already feel the Pacific power. We didn't know if the spot had reef, sharks or crocs, but felt somewhat safe since two surfers were already out. The surfers turned out to be locals Carlos (current Costa national surf champ) and Greivin Sandoval who was also the hotel's restaurant manager. Carlos spoke no english and Greivin spoke some english. After the session, Carlos asked "usted Hermosa?" We replied..."no, Florida". He pointed south and said "Hermosa, Hermosa". Greivin expained that was a powerful beach break south around the end of the bay, and that Carlos was asking if we had seen it that day. Then he talked us into staying at the Jaco Beach Hotel instead of searching for more surf further south. "Surfer special - ten dollars each" he explained. "Stoked!" The hotel was almost empty... no other surfers around. He was trying to get the hotel to promote surfing to attract more guests. "Why explore any more?" we asked ourselves. We had found a nice little beach town, a clean hotel with fun surf out back and friendly locals... so we checked in and remained there. Just twenty dollars per room for us that year. Air conditioning, 2 comfortable beds, maid service, bathroom with plenty of hot water, nice restaurant, protected parking and ocean front. 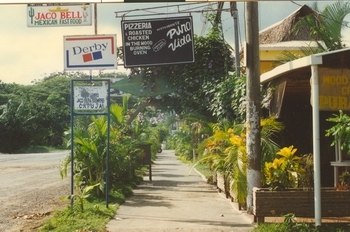 downtown Jaco - 1986 We spent the next 4 days there, surfing Jaco and Hermosa with just 4 locals. Greivin made sure we were well fed. 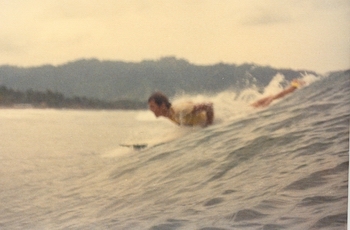 Jaco did not have any surf shops then. We enjoyed walking through town, visiting the ice cream and pastry shops. 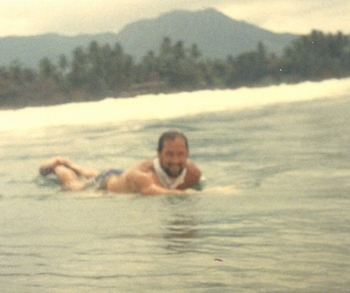 We surfed three times a day and were living the dream. 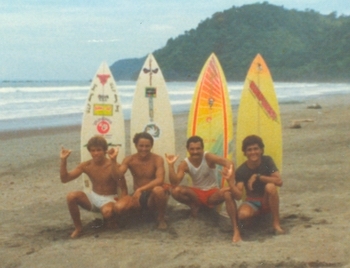 We returned to Costa next summer with friends Bill Webster, Chuck Savard, Bruce Williamson and my 15 year old son, Bobby. We stayed at the Jaco Beach hotel again. Greivin was still there and really took care of us. There had been an earthquake just months before, so he put us on the ground floor of their new building. I was awaken one evening around 2am by Bill Webster banging on my door. He was alarmed by the sounds of shaking glass in his jalousy windows. Mine were shaking every now and then and making that tinkle, tinkle sound. "Earthquake!?" We were not sure because there seemed to be a rythmatic pattern to the vibrations. The windows would shake about every 15-20 seconds. We stepped outside and soon realized that the glass was shaking from breaking waves of a huge groundswell pounding our beach. We ran down to the beach in the dark and could see monster surf in the moonlight. "Wow!" We couldn't get back to sleep after that as we contemplated what the day's surf would be like. 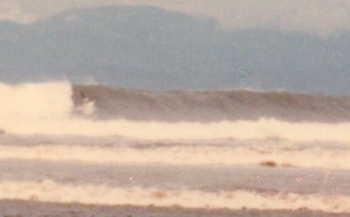 That morning, Jaco was a solid 12 feet at high tide and closing out. So we grabbed boards, locals Carlos and Greivin and drove 10 minutes south to Hermosa. "Muy Peligro" Carlos said softly as we watched solid 15 foot bombs sucking the black sand off the bottom. "Let's try Boca Barranca ... could be fun!". Carlos and Greivin were stoked to go with us and helped us find the way there. Greivin drove our rented van. Upon arriving we paused on top of the Barranca bridge to check the surf. The break was so far out that it still looked small... UNTIL we noticed a little white thread moving up and down the face of a long breaking left wall. "Holy smokes!!!" "That was a surfer!" This is what we had come for... world class point break in the 8-15 foot range... just two guys out. Greivin almost rolled the van as he turned sharpley off the road at the foot of the bridge. We parked at the end of the dirt road where the Barranca river emptied into the bay. We surfed that big swell at Boca for 3 days. Many rides were over a mile long with 45 minute dry paddle backs. 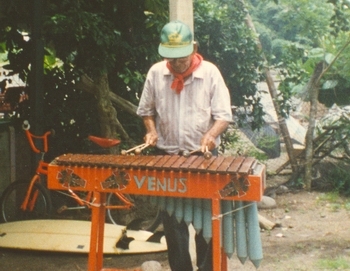 ...he loved to entertain us I've made many good Costa Rican friends through the years of traveling there. But no one as memorable as Cundo. We met Cundo after that first Boca session. He was chasing away would-be thieves from our van... swinging a bicycle chain at them as they fled. He was in his early seventies and spoke no english but Greivin translated for us. He offered to let us park in his yard whenever we returrned to Boca. 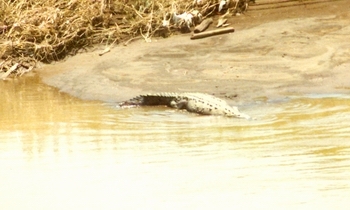 His property was at the end of the road, on the corner of the Barranca river and the bay. He had lived there for 57 years at that time in a shack made up of assorted corragated tin and other materials. He raised his family there. His wife was bed ridden and dying of diabetes. We returned the next morning for day two of that swell and gave Cundo 500 colones for letting us park there and protecting our vehicle. He was stoked! Next year, when I returned, he was wearing a whistle and directing parking onto his property. Cundo built quite a little enterprise there by watching surfers vehicles for them as that area was notorious for open crime. 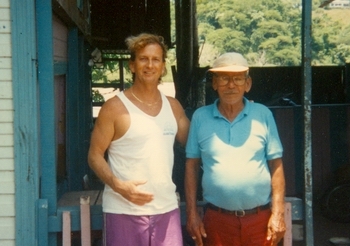 I returned often to visit with Cundo and spent many nights there sleeping on his dirt floor. He, his son and I would get stupid drunk every night off his home made guava wine. He would talk story all night and I never understood a word he said. His shack was later torn down and replaced with a concrete villa some years ago. Cundo sold out and moved in with his son in Punteranous. 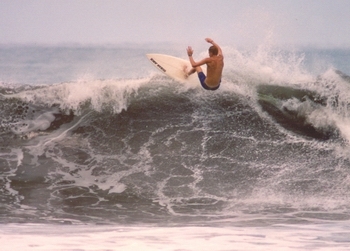 Costa offers so many different kinds of surf breaks to choose from. Like other locations, you soon learn how and when different spots break. 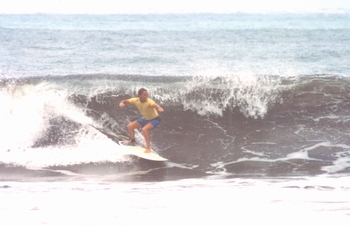 I've visited Costa now about 25 times and have surfed most everywhere from Dominical to Ollies Point. I've traveled with groups and have enjoyed many solo trips with just a couple of shortboards. I've found great surf at Valors, Hurradura, Escondido, Witches Rock, Ollies, Playa Negra, Playa Grande, Esterillos, Nosara, Mal Pais, No Gringos and many hidden coves with no names. I've taken a longboard three times, but never unpacked it as the waves have always been too shortboard inviting to me. I was there during 9-11 with new friends. We just finished a fun morning session and were stunned to learn that the World Trade Centers and Pentagon had been bombed with hi-jacked jetliners. Stranded there for several extra days, we tried to enjoy the surf, but our trip was overshadowed by what had happened back home. Peggy and I have returned a couple of times since to explore Dominical and other areas. 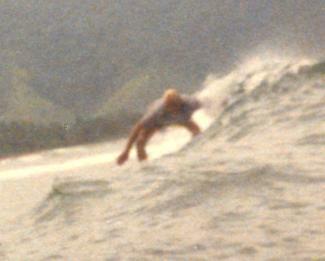 We always stop by Boca to surf it a couple of times and visit my old friend Cundo. He was stoked to meet Peggy and see that I had finally settled down again. "Esposa y familia es bueno" he said. 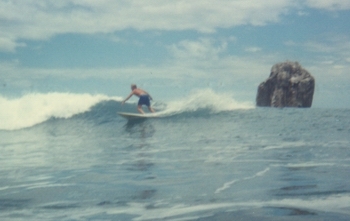 I've surfed Mexico, Hawaii and other spots, but still enjoy Costa for a quick and easy surf trip. These days I travel there with wife, Peggy. We always make it a point to spend our last night at the Tabacon Resort at the foot of Volcano Arenal. This is a wonderful place to wind down, spend some romantic time together and enjoy relazing in the many natural hot mineral springs cascading down from the volcano. Arenal erupts about every 45 minutes with a great display. The area is full of monkeys and parrots. I use that night to repack my boards, reflect on the trip and dream of returning again, soon.